The BodyPure foot pads are the latest way to detoxify the body. Our body is exposed to too much of toxins from the surroundings. It takes a daily effort to completely erase them from the system. These detox foot pads are easy way to get rid of them. BodyPure foot pads for detox is are easy to use pads that can be attached to the foot during night. It absorbs the toxins from the body and you can discard the used, toxin collected pads in the morning. Now the question is, why should anyone use these BodyPure foot pads and what is the need for the detoxification of the body. Our body is exposed to dirt both internally and externally. The external dirt is washed away with water and soap. What about the internal dirt that we accumulate? It takes certain compounds to get this internal dirt which we call toxins, to be removed from the body. When left there for longer, these toxins can harm the body in so many ways. Toxins like heavy metals can really attach themselves to the tissues inside the body and can be the most stubborn to get rid of. Started in 2003, BodyPure has been delivering many healing and natural medicinal products all over USA. From detox pads to pain recovery pads, there are many body pure circulation pads that deliver optimum support for you. Foot Is The Target For Such Detoxification Process, Why? All our internal organs are connected to the foot. Each area of our foot is related to one organ of ours. Why do you think that simple foot massage helps you relax or going out for a walk is all you need for some relaxation? This is because the little pressure on particular areas on the foot can have its effect on the relevant organs. The toxins that reach inside the body can be spread all over and can find its home in our organs. If you want to target all the organs at the same time, the best choice is to concentrate on the foot. Since foot is connected to all organs, whatever we do there can have its effects on the respective organs. Here, the BodyPure foot pads mainly concentrate on the areas f liver, gallbladder, pancreas, spleen, adrenal glands, stomach, waistline, colon, intestines, bladder, and kidneys. The given patches cover these areas. BodyPure is a family owned business headed by the Naturopathic doctor Dr. Daniel Vinograd. He had been researching for ways to detoxify the body from the toxins that are involved in dentistry. His work lead to the making of BodyPure and different products that helps in detoxifying the body. At BodyPure the products are of 3 main categories. There are products that mainly focusing on detoxification, that are used to improve the circulation and reduce soreness in the feet and the final category of purification of other means and probiotic products. The products include the foot pads, homeopathic medicine, probiotics supplements, and an ozonizer. The BodyPure+ and BodyPure 2x foot pads are beneficial to reduce the fatigue or sluggishness that you feel, improves the immunity and enables better sleep at night. It removes the toxins from the body and also improves the blood circulation all over the body. Use this Natural and herbal foot pads on your foot for around 10 hours to get rid of any toxic chemicals, metals etc. from your body. It is 100% effective and quite easy to apply. Both BodyPure+ and BodyPure 2x contains the same ingredients. The only difference is that the BodyPure 2x has double the quantity of each extract or ingredient in it than the former. The basic constitution is the same. Bamboo vinegar extract: Bamboo vinegar is the major ingredient that draws the toxins from various parts of the body toward the feet and then absorbs it on to the patches. Houttuynia cordata extract: It can absorb toxins from the body, boost immunity, and improve skin health. It contains high amount of antioxidants, alkaloids and other livflavonoids. Loquat leaf extract contains so many nutrients and most important of them all is the amygdalin which is otherwise known as vitamin B17. This vitamin is responsible for the fluid secretion from the body. It focuses on liver detoxification and ensures that the liver functions normal. While detoxifying the liver it opens gate for the entire body detoxification also. Tourmaline is one of the major ingredients in this detox program. This is a mineral that can emit negative ions into the body. These negative ions would then urge the body to cleanses itself and triggers natural detoxification process. This mineral can exert lberating energy through the nerves for a stabilizing effect. Diatomaceous earth has high absorbency and can hold a large quantity of liquid and yet stay in its dry powdered form. In BodyPure foot pads its can absorb the moisture or sweat from the body and keep the pads dry all the while. It also has special affinity to the heavy metals such as mercury, cadmium, lead etc. it can deal with poisonous substances from the body. Citronella is added for the benefit of skin. It can soothe skin and also possess antibacterial and deodorizing properties. It can control excessive perspiration. Most people sweat excessive through their feet and by adding this in these foot pads, it can control the moisture. It is diuretic in nature and would have similar effects on the detoxification of the kidneys. Dextrin is a starch with adhesive properties. This helps the other ingredients to bond together and also increases the adhesiveness of the toxins to the aforementioned ingredients. How Does BodyPure+ or BodyPure 2x Work? The science behind BodyPure+ is that the ingredients added in them can emit far infrared energy. This energy is enough to stimulate the kidneys to draw in more toxins. The wood vinegar can create an osmotic shift in the interface centers where the skin meets the patch. There, the toxins are transferred on to the pads and also accelerate the natural toxin elimination process. Wipe clean the foot and dry it completely. Remove the BodyPure foot and adhesive sheet from the pack and place the foot pad on the adhesive sheet with the paper side down. Remove the cover of the adhesive sheet and place the pad and adhesive on the bottom of one foot. Keep this pad there for 8-10 hours. Remove the pad in the morning. Wash and wipe the leg clean later. The used pad would be black or brown in color that reveals that it has worked and has removed toxins from the body. The dark colored substances are the toxins. Regular usage of the foot pads will show the discoloration on the used pads and the color will gradually reduce in time. Use only one foot pad per day and alternate it on either foot on every night. The recommended period of usage would be one month to 3 months depending on the toxin level. To check it for yourself, there is a color code to match the color in the used pad to know which type of toxins are eliminated from the body. Each color denotes the type of toxin and the target organ that it has cleaned. Black is for the toxins from the liver mainly, flecks in black color or grey color would be the heavy metals from the tissues, brown colored toxins are the liver and cell debris, dark green color denotes the gallbladder waste. Orange color is for joints, red flecks are blood clots, white colored curdy or cheesy looking would most probably be the yeast, white foamy appearance is for the lymphatic waste and yellowish green reveals to be the waste from kidney, bladder and prostate. The used foot pad could be sent for an analysis of the toxins that has been absorbed on to the pads. The test reveals the type of toxin and its level in the sample. Though this toxin pad analysis, known as CTS 7-toxin used pad analysis can be purchased separately, it is available for free with a purchase of BodyPure 3-pack. There is also a hair analysis done on your hair sample to check the overall toxin level in your body. You can then compare the results of the general toxic level in the body with the used pad to see how much of it has been eliminated. On purchase of these analyses, all cost for the shipping and test are included in the final price. You can send the samples in a pre-paid, pre-posted covers and includes all the necessary items. Kim from Houston tried it for 2 weeks and has successfully lost weight. The cellulite amount of her body has come down with detoxification of the body. Raymond, a happy customer from Montreal wonders why everyone does not use these detox foot pads for their benefit. He says it is never early to start the detox of one’s body. Cecilia stresses that the pad seems gross in the morning but she is happy that all the impurities are out of her body than inside. Gary tried it for 5 days continuously to get rid of maximum toxins out of the body. He also states that the pads are available at a great price. Mary got to get rid of the fatigue issues after she had successfully eliminated the body toxins with the help of BodyPure 2X foot pads. Clare is another user who got energized after using these foot pads. Catherine is happy with the results as well as with the price. She recommends this to all athletes. Glenda remarks these foot pads as a gentle and great way to settle down after an exhausting day. LiverX is a liver supportive supplement that can improve its function of natural body detoxification. This product contains essential nutrients that are liver supportive and helps the body deal with free radicals and detoxification. It also aids in digestion and makes an enormous contribution in energy production. LiverX™ offers you an unique combination of nutrients such as N-Acetyl-Cysteine (NAC), Alpha-Lipoic Acid, Vitamins E and B12 that fight free radicals and completely cleanse your body. Vitamin E as d-alpha-tocopherol: Liver functions diminish with low levels of this vitamin. Having this vitamin in the body can boost the liver functions. Vitamin B12 as methylcobalamin: Firstly, this vitamin can prevent the inflammation in liver and can regenerate liver cells. It can also help with energy production. N-Acetyl-Cysteine: the natural detoxification in the body is triggered by glutathione which is made from N-Acetyl Cysteine. The sulfhydryl gropus on this amino acid derivative is the key here. Also, the glutathione produced from this is powerful antioxidant that scavenges the free radicals in the body and makes the function of liver easier. Supplementing with this ingredient drastically reduce the toxic substances in the body. Proprietary Silymarin blend of Milk Thistle extract contains Silymarin, an antioxidant that can not only fight the free radicals but can also help in the repair of liver cells. Similarly, it helps the body eliminate many toxins as well. Picrorrhiza kurroa extract is a liver tonic that can also improve the potency of Silymarin. It is protective of liver and also possesses immune modulatory properties. The toxins or effects of stress that can affect the liver are thwarted by this extract. Andrographis paniculata extract is another herb that can prevent liver damage and is supportive of healthy liver. Equally, it reduces the toxicity in the body by aiding liver functions. Alpha-Lipoic acid is another antioxidant to protect liver and other cells. It is also a precursor to glutathione that increases ts potency in LiverX. Firstly, the recommended dosage of LiverX is 1-2 capsules per day. When needed under the dire situations like high stress or during detoxification, the dose can be increased to 4 capsules a day. Candida albicans, a fungus is also considered a toxin to the body. It can cause troubles like, yeast infections, thrush, nail fungus, headache, skin irritations etc. Moreover, the increased level of fungus in body can also lead to other discomforts and diseases as well. Aquaflora Candida is a remedy to eliminate thus fungus. Further, Aquaflora Candida is a liquid formulation that can be mixed with drinking water and fit to use for all, men, women, and children. There would be no taste difference by adding this into the water. It helps correct the health imbalances created by the overgrowth of Candida. Also, the mycotoxins released by this fungi cause all the problems. Thus homeopathic preparation is a multi strain formula that includes 22 ingredients. Abies Canadensis –effective against gnawing hunger, cravings and light headedness. Borax is helping with nervousness and intestine problems. The dosage for adults is to mix a capful of this supplement in a glass of water and taken in the morning on an empty stomach and another same dose at night before bed. A single bottle of this formulation lasts for 16b days for an adult. The pack includes 2 bottles of this liquid to last for a month. It can also be given to children between the age of 2-12. For them, the dosage is ½ capful of the liquid given 2 times a day. The first dose is in the morning before breakfast and another at night before bed. The effects should be seen within a day. The symptoms are most likely to disappear within 2 weeks time. Besides, the recovery period may vary from person to person. It also depends on the intensity of the fungal growth or digestive degeneration that has happened. Firstly, Aquaflora Candida is safe to use for a long term plan. Once the symptoms are relieved, and intestinal balance seems to be balanced, switch to a preventive dose to avoid any recurrence. Initially, the preventive dose suggested is to use it for only 1-3 days in a week. Next step is to change it to 3 successive days in a month. Next stage is to take the liquid at regular dose for 1 month. Take this once in every 6 months. Then later you can have it once- 1 month every year. The next category of products is that focuses on the other kind of purification and immune strengthening Probiotics. Probiotics are the collection of good bacteria that can fight the bad ones and can strengthen the immune system and digestive system. 5 Lac probiotic is a dietary supplement that adds the friendly flora into the system. Packed in individual packs, Five Lac can replenish the intestinal tract with friendly bacteria to improve the digestion and nutrient absorption. The ingredients list include the proprietary blend of Bacillus coagulans, refined dry yeast, fruct-oligosaccharides, galactomanan, Bacillus subtilis, Enterococcus faecalis, Bifidobacterium longum, Lactobacilus acidophilus and vitamins C, B1, B6 and B2. Lemon juice powder is added for the taste. Bifidobacterium longum smoothens the digestive system functioning. Lactobacillus acidophilus produce lactic acid and breaks down the nutrients and provide many other useful by-products. All of these are made into small micro capsules for easy daily consumption. Also, the micro-encapsulation allows it to reach the intestine without getting digested. The motto of this probiotics is to kill the Candida. The detoxification product in the intestine eliminates the harmful Candida. It would also reinstate the good bacteria in the intestine. Five Lac is a powerful, enhanced probiotic formulation that boosts the friendly bacteria to promote intestinal health. It delivers five potent microflora in a lemon-powder base. It also benefits in relieving skin problems like acne, dry skin, itching etc and cures allergies also. The digestive disorders like extreme lactose intolerance, lethargy, and anxiety are also relieved. FiveLac comes in powdered form that can be emptied directly into the mouth and wash it down with water. It can also be mixed with water or other drinks. Increase the dose slowly in the first 60 days. After 60 days the dose should be one packet per day as maintenance. FiveLac is not fit to be used along with antibiotics. It is also not fit for pregnant women and nursing mothers or people with weak immune system. Ozonizer has special place at home in detoxifying the water, food, household surfaces. It uses no chemicals to clean these. The ozonizers are also growing in popularity. Moreover, the 1000 mgh Ozonizer can be used for all these purposes and mainly for the oral care hygiene. Since the BodyPure has been created to find solution to detoxify the dentistry related items, its use has been given most importance. Ozone is powerful to kill healthy bacteria that are ready to destroy your comfort. This power of ozone is used for destroying bacteria, deodorize and also as a disinfectant. Since the life of ozone is too short it can be used for mouth cleansing as well. In this short life it can go on to oxidize all the organic matter to destabilize it. The ozonizer adds more oxygen into the water. Oxygen is not something the bacteria like. The 1000 mgh Ozonizer is a device that can be used with all sort of water reservoir. Here, this ozonizer is used to prevent periodontal disease. All you need is an ozonizer and a water irrigation device to rinse the mouth. With medium pressure the water irrigation between the teeth and gum can help prevent tooth decay. It clears the bacteria and also helps close the gap between the teeth and gum. Switch on the ozonizer and choose the setting for the duration of the ozone generation in the water. There is also a safe tube to be attached to the ozonizer on one end and into the water reservoir on the other. Allow the ozonizer to work at least 10 minutes before you use the water. The ozonizer can be set for auto shut off for safety. You can also use this to clean the vegetables and fruits. The ozone in the water is enough to oxidize all kinds of chemicals and compounds in them. Use the same water to clean the household surfaces instead of chemical sprays. The important point to note is that the ozone that is formed has very short life, so you need to use this ozonized water at the earliest possible. Storing this ozonized water will not have any use later as the ozone molecules are later reverted back to oxygen molecules. These BodyPure foot pads are also used for recovery purposes that improve the circulation and speed up the injury recovery period. There is this Sports Recovery Pads and then there is this Mobility pads that increases the circulation through the legs. The Sports Recovery pads are concentrating more on the sleep quality and improving the energy levels. Both sleep and body energy has more importance in recovery from muscle injury or soreness. These pads increase the overall blood circulation and provide more oxygen for the cells. Sports recovery pads are herbal pads that are attached to the foot during night. It helps with recuperating, replenishing, and revitalizing the body. By allowing quality sleep the body automatically gets more energy. The improvement in blood circulation will sure speed up the recovery process and heals the injury. It also helps in fighting the oxidative stress that the body suffers during this period. The body will feel less lethargic. How Does The Sports Recovery Pad Work? The Sports recovery pads are to be attached under the feet during the night. It has been improved from the BodyPure detox pads. With the many reviews of getting better sleep, the idea of these recovery pads was raised. By attaching these pads to the feet the body heat triggers the effects. It starts emitting the far infrared waves to trigger the said changes in the body. This generated heat will dilate the capillaries and increases the blood circulation. All these effects are from the herbal ingredients used. The Sports recovery pad pack contains two pieces, one Body Pure foot pad, and an adhesive sheet to help attach the foot pad on to the feet. Use only one pad per feet per day. Alternate the legs on each day. The right way of attachment and details are all given on the pack. Make sure that the leg that you are attaching this pad is clean and dry. White Tourmaline is a gem stone that has benefits. It is used in its powdered form which is the major ingredient in these recovery pads. On getting heated, this can be electrically charged and emit the fat infrared heat. This heat will stimulate the body for better circulation. It basically affects the natural energy field of the body by generating negative ions. These negative ions are the main reason for the bodily changes for good. Bamboo vinegar has many benefits for the wellness. It can affect the main organs, detoxify them to work better. The benefit here in the recovery pads is that it can fight inflammation which is what is needed for the recovery. It can also influence the blood circulation and increase it. Peppermint: Peppermint is soothing and is exactly the reason why it is used here. The soothing effects of this herb can relax the muscles and help with the soreness of inflammation. It is an excellent remedy for muscle cramps. The soothing effects will reduce the pain as well. Arnica is another herb that is well known for its healing properties. It is good for bruises, soreness, swelling, sprains, or muscle pain. It is mainly used for topical treatment. Besides, it also relieves the soreness and works well with others soothing and healing ingredients used in these foot pads. It also has the anti-bacterial property that reduces chances of infection on bruises. Nopal or Prickly pear has been used for arthritis pain and soreness. It can relieve the swelling and stiffness that bothers. Nopal has anti-inflammation, anti-oxidant properties. Further, it also possesses the ability to improve the energy allowance of body. This is also one of the popular herbal ingredients used for physical rehabilitation. It has this rare compound betalains that works these wonders. The antioxidant property acts against the free radicals and lessen the chances of inflammation. Kava root extract has relaxing effects on the muscles to reduce the pain and inflammation. It can practically numb the area it is applied to relieve the discomfort. This extract has diuretic property that expels the toxins from the body. Pine bark extract: The Pine bark extract has proanthocyanidins and antioxidants. They both can act on the immune system as an immune stimulant. The improvement in immunity helps in recovery and healing. It can affect cardio vascular system as well as the skin health. It reduces inflammation, increase flexibility of muscles and also protect the cells of joints against arthritis. This ingredient is also effective in fighting allergies like asthma. Burdock root extract: Burdock root extract is another well known pain reliever. It contains fatty acids, sterols, and tannins that fight inflammations. The essential oils eliminate many toxins from the body. It can prevent the buildup of lactic acid in the muscles and alleviates pain. The antioxidants in this can fight the free radicals that lead to inflammations. Not only can this help in muscle recovery but also assists in muscle mass. Vitamin C is a minor ingredient in Sports recovery pads but important nonetheless. It helps in reducing the muscle soreness. The oxidative stress is also reduced tremendously and improves the overall immunity of the body. The Sports recovery pads are available in monthly pack of 14 pads or 3 months pack that has 42 pads in it. The idea is to use one pad on either foot on alternate days. 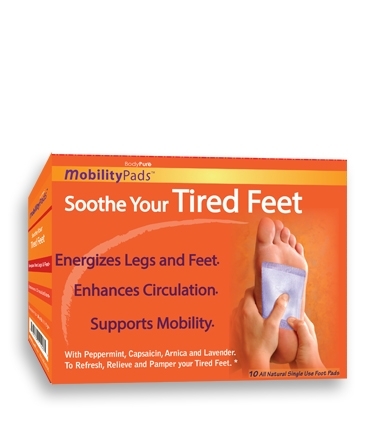 Mobility foot pads are soothing to the tired feet. It increases the blood circulation and relieves the lethargic feel on the feet. People who spend majority of their time on their feet can benefit highly from this. It relieves the tiredness and soreness from the feet. The soothing effect of it would also allow better sleep at night. The increased blood circulation will restore the sensation and energy to the feet. How Mobility Foot Pads Work? The mobility foot pads are aimed at using for up to 10 hrs during night. By attaching these foot pads at night it can get started with its work by getting the body heat. The body heat triggers the infrared heat generation in the pads. This heat will then return to the body and dilate the blood capillaries and increases the blood circulation. This blood circulation takes away the tired feel by getting more oxygen and energy to the cells. Mobility foot pads are not therapeutic or healing. It is just supportive in function to relieve the tiredness sat the end of the day. With frequent time spent on the feet, the body does not get enough time to recover any damage of lethargy in this area. These foot pads can improve the healing within the short available time. The goodness of these pads is also supported well with the herbs chosen in the making of them. White tourmaline powder has the ability to generate electrical heat when get heated itself. The body heat triggers this ability to create infrared heat. This stimulates blood circulation and makes these foot pads useful. Capsaicin is a stable alkaloid that has powerful anti-inflammatory property. The usefulness of this ingredient is that it is able to prevent the production of substance P that is common in people who suffers arthritis. The level of this substance is reduced to relieve the pain. Peppermint is useful because of the menthol content. It can soothe the muscles and relieve pain, if there any. Arnica extract can heal any bruises or sprain. The feet that are tired might have pain of any intensity. This pain is relieved with the help of the anti-inflammatory property this herb has. Roman Chamomile is once again a soothing agent and relieves stress as well. The antiseptic and antimicrobial properties also help in preventing any more damage. Ginger is also an ingredient that has natural anti-inflammatory effects. It reduces pain or inflammation mainly in the muscles or joints. The increase in blood circulation also works well towards this goal. Lavender oil: Lavender oil is soothing to the muscles to relax them and get rid of soreness of any discomfort there. Other ingredients include Aloe vera, wood vinegar, dextrin, diatomaceous earth, vitamin C, and vegetable fiber. The diatomaceous earth controls the moisture on the feet while wood vinegar contributes in body detox, blood circulation improvement, and inflammation prevention. Why should I use BodyPure+, BodyPure 2x, Aquaflora Candida or any other internal cleansing products? Doesn’t my own body work on the natural detoxification? Of course your body indulges in natural detoxification process. It can work well if the toxic level is at an easier range. When we are frequently exposed to daily toxins or the growth of yeast go beyond control, the body cannot get rid of it naturally. It will need assistance in the form of these products. These products help with faster detox process by acting on its own and also triggering the body’s natural detox process. When should I concentrate of the detox products? When you are frequenting with constant fatigue, digestive issues, brain fog, headaches, poor blood circulation, allergies, infections, or cellulite, you should start on detoxification as they are symptoms of high toxin level in the body. We are exposed to various types of toxins from the air, water and our environment so it is advised to take some kind of detox program at least once a year. Can I reuse the BodyPure detox foot pads if it comes out dry and rather clean? No, never! The foot pads are meant as one-time use and must be discarded after use. Even if you don’t see any discoloration, there could be toxins in minor levels absorbed from the body. Once used, the foot pads are contaminated and unfit to use again. What is the frequency I should the BodyPure foot pads for detoxification? The detox foot pads should be used for a 30 day period at least, initially. It can also be prolonged until the patches come off clean. Remember to use the patches on both feet alternatively. Later when the pads come cleaner, you can stop usage and then switch to maintenance. The maintenance use is to use one patch used once in 1-3 weeks. How safe is to use these BodyPure foot pads? All the foot pads for detox and recovery contain only natural ingredients and are safe to use. There is no use of allergens of chemical additives that are harmful for the body.